The biblical truth that resounds in our Christian school’s curriculum is that all things in the world belong to God. It is important that we not presume that this truth is obvious or apparent to all. The task of a Christian school teacher is to help reveal God’s grand story in all things. Thus, a teacher’s task is one of Christian-story telling, of seeking out and helping students to “See The Story” in all areas of study. We do this by teaching under the principle of all things. God created all things. It is into this story The Teaching for Transformation Throughlines, as developed by The Prairie Centre for Christian Education (PCCE) region, provides a framework for the development of authentic and integral Christian learning experiences that are grounded in a transformational worldview with a focus on the Biblical story. A website has also been prepared with some introductory information. 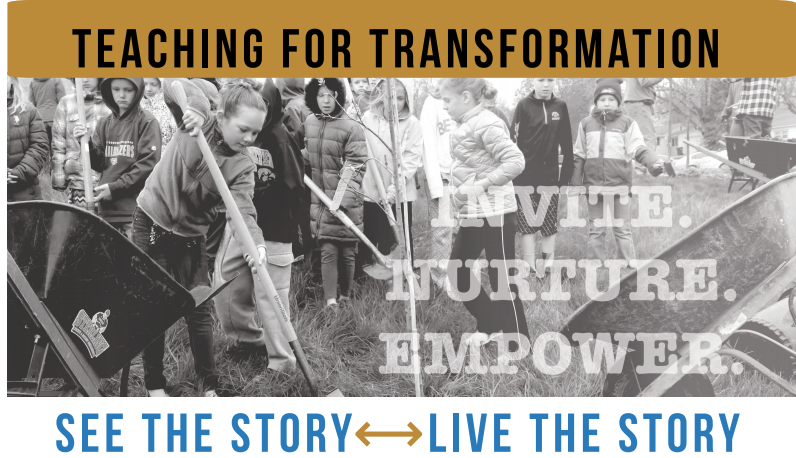 For more information on the Teaching for Transformation program, including interest in using this program in your school or organization, please contact Gayle Monsma, Executive Director of The Prairie Centre for Christian Education at 780.465.8384 or gmonsma@pcce.ca.